In this study, mass spectrometric techniques (THM–Py–GCMS, DTMS and ESI–MS) have been used to characterize the organic fraction of early twentieth century oil-based enamel paints. Analysis has been carried out on dry and liquid samples from historical reference paints, and on color swatches from commercial paint brochures, with a special focus on Ripolin. 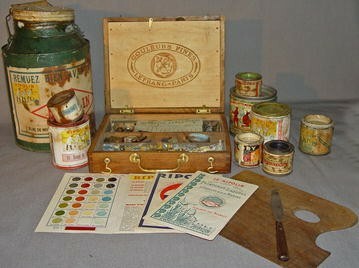 This renowned French brand of enamel paints, manufactured for household and other uses since 1897, was reportedly used by many avant-garde artists. Confirming the presence of enamel paint such as Ripolin in early twentieth century artworks scientifically through binding medium analysis is challenging because, until the end of the Second World War, the most widely used house paints were oil-based and chemically similar to artists’ oil paints. In addition, artists often modified/reformulated materials including oils, driers, industrial and house paints to customize their handling and optical properties. The challenge of identifying oil-based enamel paints on the basis of chemical composition is illustrated by the analysis of samples from two paintings by Wassily Kandinsky and Pablo Picasso. Analysis demonstrated that the organic fraction of Ripolin paints is typically composed of heat-bodied linseed oil in mixture with variable amounts of diterpene (Pinaceae) resin, in accordance with the industrial technical literature of the time. Comparative analyses of Lefranc artists’ tube paints suggested a more variable composition with respect to the type(s) of oil and their pre-treatment, and showed the presence of Pinaceae resin at trace levels only in two cases. Beeswax was detected in one of the tube paints tested. The results of this study indicate that complementary information can be obtained from the study of liquid paint from cans and dried paint-outs, while the media of painted brochures may differ from the original formulation as those were designed for expediency of drying and aesthetics. The results also elucidate how formulations and processing technology influence the physical and drying properties of oil-based enamel paints, in comparison with contemporary artists’ oil tube paints. Further research on a broader range of reference materials should help in the development of refined strategies for characterizing oil-based paints from the early twentieth century. Ripolin enamel paints, paint brochures and Lefranc artists’ tube paints in the Art Institute of Chicago's reference collection. Ready-mixed industrial and household paints were an invention of the late nineteenth-early twentieth century . Significant advances in paint technology and experimentation with different types of raw or heat-processed oils, resins and curing agents, provided commercial painters with products that had good hiding and levelling properties, consistency and brushability, provided adequate protection to the surface, dried fast, and came ready-mixed in an easy-to-use can . Similarly, the formulations of artists’ tube paints were expanded to include a variety of ingredients, with a drying oil (one rich in polyunsaturated triglycerides) or mixtures of oils as the main component, and additives such as wax, rosin or metal soaps. The tube paint was designed to dry through oxidative cross-linking of the oil binder upon exposure to air and in the presence of a catalyst, which could be one of the pigments themselves, in a process that could take months to achieve a dry-to-the-touch surface and decades to reach a fully cured status. The ability for the paint to retain brushstrokes was important, as well as its thixotropic properties. On the other hand, industrial and household oil-based enamel paints were applied in thin coatings and required to be dry to the touch in a few hours and cured within days. A brushless surface appearance was desired in most cases. In this context the term “enamel” describes the glossy, porcelain-like finish of the dried paint: a brushless surface appearance was desired in most cases. Oil-based enamel paints soon became popular among avant-garde European painters: Pablo Picasso, Wassily Kandinsky, Francis Picabia, and René Magritte are among those reported to have used such paints in their works, in particular those produced by Ripolin. Ripolin paints were originally developed in the Netherlands in the early 1890s through the work of the chemist Carl Julius Ferdinand Riep , and from 1897 until the end of the Second World War Ripolin production took place on the premises of the famed fine artists’ materials manufacturer Lefranc, in Issy-les-Moulineaux, a suburb of Paris. Ripolin paints were high grade enamels that enjoyed enormous success in commercial applications as well as with the avant-garde artists of the time [8, 15, 24, 25, 39]. Confirming the presence of enamel paint such as Ripolin in early twentieth century artworks scientifically through binding medium analysis is challenging because, until the end of the Second World War, the most widely used house paints were oil-based and chemically similar to artists’ oil paints. In addition, artists often modified their paints through the mixing of colors, as well as the addition of mediums, thinners, driers, waxes etc. to customize their handling and optical properties. As a result, suppositions about the presence of house paints in artworks have typically been based on a combination of visual characteristics, anecdotal and historical references. However, a growing body of reference data on the composition of paints from this period may help to provide more informed interpretations and distinctions between the different types of paints. While the pigments and extenders for a large part of Ripolin’s production, spanning the period 1890–1950, have been documented [19, 39], no in-depth characterization of the organic fraction has been published to date. Because of a growing interest in the formulations of 20th century oil paints , with the publication of several isolated studies of oil-based enamels of the period [1, 7, 16, 21, 45], the results of this systematic study of the composition of the most important French brand of the early 20th century and its correlation with data from contemporary Lefranc artists’ tube paint samples represent an important benchmark. Chromatographic and mass spectrometric methods have been extensively applied for the characterization of binding media of Old Master paintings and, similarly, of acrylics and other synthetic media, but only few studies to date have focused on the technology of oil-based enamel paints from the first half of the 20th century. To fill this gap, and to provide a thorough characterization of 20th century oil-based enamel paints, several mass spectrometric techniques were used: pyrolysis gas chromatography mass spectrometry with thermally-assisted hydrolysis and methylation (Py–THM–GCMS), direct temperature-resolved mass spectrometry (DTMS) and electrospray ionization mass spectrometry (ESI–MS). While GCMS techniques are well established for determination of the molecular components of oils and resins, direct MS techniques such as DTMS and ESI–MS provide complementary information on paint composition since they can indicate the chemical form of species such as fatty and terpene acids in the paint (i.e. free, ionically or covalently bonded), and allow characterization of higher molecular weight and polymeric fractions not amenable to Py–THM–GCMS analysis. The comparative analysis of paint in different forms—liquid samples from cans, dried paint-outs, and color swatches in brochures—provided further insights into drying and ageing processes in the media, as well as the adjustments made by paint manufacturers to their formulations for different purposes. The experimental work conducted here is also important to shed light on the relative merits of these different kinds of samples for historic paint analysis. This paper presents results from the characterization of the binding media of an extensive reference collection of early 20th century house paints, primarily Ripolin, along with paint brochures and Lefranc artists’ tube paints assembled at the Art Institute of Chicago (AIC, Fig. 1). Two analytical case studies are presented to illustrate the challenges in discriminating industrial house paints and artists’ paints in practice: Kandinsky’s Leichtes 1930 (69 × 48 cm, AM-1974-16; Musée National d’Art Moderne, MNAM, Centre Georges Pompidou) and Picasso’s Pêcheur assis à la casquette, 1946 (106.5 × 82.5 cm, Musée Picasso Antibes, MPA 1946.1.20). Ripolin and other oil-based enamel paints in the Art Institute of Chicago’s reference collection. The oil-based enamel paints, all made by Ripolin except one ultramarine blue paint made by Bengaline, another French firm; and Lefranc tube paints were applied to microscope slides using a fixed-thickness applicator to achieve a uniform film of approximately 100–200 microns. For this investigation paint samples were taken from films which had been stored at ambient temperature in a variety of light conditions (dark storage and ambient indoor light) for approximately 6 years. Additional liquid and dried paint samples were taken directly from paint cans for analysis: when well-sealed, some cans have preserved their content in the liquid phase for almost a century. The examined samples cover a broad range of colors and dates of manufacture. 20 Ripolin paint sample cards (“brochures”, each containing 20–86 swatches of paint), which represent the entire color range produced by the company in France and roughly cover the period 1897–1950, have been gathered and analysed as reported in an earlier study ; several examples are discussed here for comparison with the samples from cans. In total, 31 samples of historic reference paints were analyzed for this study. The paint sample from Kandinsky’s Leichtes 1930 (sample #1, light blue paint from drip at edge), was provided by the MNAM, Centre Georges Pompidou, Paris , and the sample from Picasso’s Pêcheur assis à la casquette, 1946 (sample #5 from the back: drip of gray/white under “Antibes” in the artist’s writing) by the Musée Picasso, Antibes [7, 39]. The cold-pressed linseed oil used as a reference in the ESI–MS measurements was prepared by Leslie Carlyle as part of the HART (Historically Accurate Reconstructions Techniques) project ; linseed stand oil was Winsor and Newton, collection of AIC. Py–THM–GCMS analyses were performed at AIC. Samples of c. 20–50 μg were placed in stainless steel sample cups (Frontier Disposable Eco-Cup LF) and 2–4 μL of trimethylphenylammonium hydroxide (25 % in methanol), depending on the sample size, were added; after 1 min the cup was loaded into the Frontier PY-2020iD pyrolyzer. A Varian 3800 gas chromatograph was used, coupled with a 2200 ion trap mass spectrometer operated in EI positive mode (70 eV; scan range m/z 35–650). He carrier gas was used in constant flow mode (1.0 mL/min) with a 50:1 split. The pyrolyzer temperature was 600 °C, GC inlet 280 °C. The GC oven temperature was programed from 50 °C with a 2 min hold, increased at 5 °C min−1 to 260 °C, 3 min hold, and then at 20 °C min−1 to 300 °C, final hold 5.9 min; total run time 54.9 min. The Varian MS data system was used for data acquisition and processing. For DTMS analysis, an aliquot of sample is homogenized in ethanol, which is subsequently applied to a Platinum/Rhodium filament probe (Pt/Rh 9:1, diam.100 microns) and inserted in the ionization chamber of the JEOL SX102-102A 4-sector mass spectrometer for in-source analysis. Temperature was ramped after a 10 s waiting time from room temperature to approximately 800 °C at a rate of 8 °C per second. Spectra were generated at 16 eV electron ionisation over a mass range up to 1,000 Dalton at a cycle time of 1 s and accelerating voltage of 8 kV . A MP-7000 data system was used for data processing. ESI–MS was performed on a Thermo nano-ESI LTQ FTMS for positive ion analysis at AMOLF (Amsterdam) and a Thermo Finnigan LcQ DUO MS for negative ion analysis at the University of Lisbon. The ethanol extracts were analyses as ammoniated solutions of paint samples as described in earlier studies . Aliquots of the paints were taken up in chloroform-ethanol (7:3) and centrifuged at 20,000 rpm to remove particulate matter. The solutions were diluted and ammonium acetate was added to a final concentration of 10 mmol. Py–THM–GCMS analysis of paint samples from the cans and brochures indicated the presence of drying oil, in most cases combined with diterpene (Pinaceae) resin, as summarised in Table 1; representative examples of data for Ripolin Blanc d’ Ivoire and Noir d’ Ivoire are shown in Fig. 2. This is in general agreement with technical literature on oleoresinous paints and specific historical references where Ripolin paint is often described as a lacquer containing linseed oil, resinous materials, some solvent and pigments  or as a ‘peinture vernissée’ containing hard or soft resins [38, 46]. n.d. = not determined: levels too low for accurate measurement. aThe numbers are Ripolin and Lefranc product numbers. bAll paint cans are Ripolin brand except one Bengaline sample, HP019 Bleu Outremer. Py–THM–GCMS data for a Ripolin Blanc d’Ivoire 53, HP008; b Ripolin Noir d’Ivoire 5, HP064; c Lefranc Noir d’Ivoire, 2007.61. P palmitic, S stearic, Su suberic, Az azelaic, Se sebacic acid, 7oxoDHA 7-oxo-dehydroabietic acid, 15OH7oxoDHA 15-hydroxy-7-oxo-DHA (all compounds detected as methyl derivatives). The typical compounds indicating a drying oil are fatty acids and dicarboxylic acids deriving from the triacylglycerols of the oil binder . The ratio of palmitic to stearic acid (P/S, based on peak areas in the total ion chromatogram) ranges from 0.87 to 1.9 for the samples tested; while most of these values fall within the range typical for linseed oil (c. 1–2), the lower values may be attributable to the presence of additives such as stearates. Metal stearates have been used in the paint industry to help suspend pigments in oil to prevent separation, to reduce the amount of oil needed to wet the pigment, and/or to increase the body of the paint by forming a gel with the oil thereby requiring less pigment . The presence of drying oil was indicated in particular by high levels of dicarboxylic acids. These are relatively stable end-products formed upon oxidation and scission of unsaturated fatty acids and are encountered in relatively high amounts in aged oil paint systems. It is thought that the ratio of the diacids suberic acid (Su, C8) to azelaic acid (Az, C9) gives an indication whether the oil has been prepolymerized by heat treatment [34, 50], since isomerization of the original double bond systems during heating leads to the formation of elevated amounts of diacids other than azelaic acid. Su/Az ratios of 0.4–0.5 have been proposed as an indication of heat-processing of the drying oils, although the value will vary according to the exact nature and extent of prepolymerization and other factors. Bodied oils such as stand oil have higher viscosity and were used in oil enamel paints to improve application and performance characteristics [9, 36]. In the dried paint samples from cans examined, the generally high Su/Az ratios of 0.36–0.59 suggest that the oil medium has undergone heat-bodying. In comparison to the dried paint samples, the liquid samples analysed did not exhibit detectable levels of diacids and correspondingly higher levels of monounsaturated (oleic) and polyunsaturated acids (linoleic, linolenic and isomers) were found; this is consistent with bulk paint that has been aged in a closed container and not exposed to oxidation. Ricinoleic acid was detected in two samples, both red paints (Ripolin rouge de Chine HP016 and HP030). These paints also showed unidentified components with an anthraquinone structure suggestive of an organic pigment (positively identified as PR83, alizarin red, with Raman spectroscopy) [19, 39]. Ricinoleic acid, a monounsaturated hydroxy C18 fatty acid, is a characteristic bio-marker for castor oil. This oil is considered a slow- or non-drying oil as it is composed of as much as 95 % ricinoleic acid, with only a few percent each of oleic and linoleic acids . Surprisingly, it was considered a suitable painting medium by Doerner , although viscous and remaining wet for a long time; other authors recommended that it be mixed with better drying oils such as linseed . It is not clear at this time whether the presence of castor oil is related to the specific formulation of the Ripolin red color or to the manufactory of a specific batch of paint at a certain point in time. For example, Dredge  in a study of Ripolin paints used by Sidney Nolan in the context of Australian house paint production mentions castor oil as a cheap alternative to linseed oil when imports to Australia from India ceased because of World War II. Erucic acid (a monounsaturated C22 fatty acid) was detected at low levels in Ripolin samples HP087 (gris perle foncé), HP013 (bleu outremer), and HP089 (bleu turquoise). This compound is characteristic of Brassicaceae oils such as rapeseed , and has been observed in oil-based paints used by other 20th century artists such as Lucio Fontana [21, 55]. It may indicate the presence of this type of oil in the paint formulation as an additive or adulterant. Although traditional household paints were based on linseed oil alone soon it became common to use oils in admixture to obtain optimum results. For example, the use of tung oil in various combinations with linseed oil was recommended [2, 22] as well as the use of other drying or semi-drying oils such as perilla, oiticica, soybean, fish and dehydrated castor oil . However, the identification of these or other types of drying or semi-drying oil recommended in the technical literature was not possible because of the lack of specific chemical markers for these materials. The main resin components identified in the reference enamel paints were abietic acid and its oxidation products including dehydroabietic acid (DHA), 7-oxo-dehydroabietic acid (7-oxo-DHA), and 15-hydroxy-7-oxo-dehydroabietic acid (15-OH-7-oxo-DHA), indicative of diterpenoid (Pinaceae) resin, most probably pine resin. As with the fatty acids, greater proportions of the unoxidised or less oxidized species, abietic acid and DHA, were found in the liquid paint samples, consistent with a scarce supply of oxygen in the bulk samples in sealed historic cans. Pinaceae resins have been known and utilised through the ages as adhesives, coatings, etc. The resins are exuded from trees as balsams, which are rather viscous solutions of diterpenoid components in mono- and sesquiterpenes. Evaporation of the volatile monoterpene fraction results in colophony (rosin), in the case of pine . Pine colophony was used extensively in the paint industry and is still a commonly used raw material for industrial purposes; its properties and durability are often improved by chemical modifications such as esterification with glycerol . Natural resins were used in the paint industry to improve the rheology of paints and to produce quick-drying, high performance enamels [10, 20]. Sesquiterpene hydrocarbons were identified in liquid and certain dried samples. These are rather volatile compounds expected to disappear in the aged samples, probably by evaporation or polymerization; their presence in the Ripolin paint samples can be associated with the relatively young age (equal or less than 100 years old) of the examined samples that have had little exposure to air. The sesquiterpenes may be associated with the added Pinaceae resins but could also indicate the addition of turpentine to the paint, which was recommended on the labels on Ripolin cans to dilute the paints. The amount of Pinaceae resin detected in the samples was found to vary according to the color: white and light-colored paint samples contained less resin than the dark colors (see Fig. 2). In the first decades of the twentieth century, high gloss enamel paints reportedly comprised drying oils mixed with a semi-fossil resin such as Congo copal and/or a soft resin such as colophony (pine rosin) and good quality opaque pigments; though colophony was regarded as a poor and unstable paint ingredient, it was extensively used in enamel paint manufacture (Mattiello, 228) in mixtures with drying oils and lime or zinc white or glycerol . Because of the perceived tendency of resins to discolor, technical manuals instructed commercial painters to make white and light-colored house paints using raw linseed oil and/or stand oil with very small quantities of resins, if any, whereas the addition of resins in large quantities was strongly recommended for darker colored enamel paints. (Mattiello, 199–206) This is in agreement with the findings on the Ripolin paints tested. The detection of Pinaceae resin in Ripolin paints is perhaps surprising, as critical reading of period technical literature seems to imply that oil-based enamels including resins in their formulations were considered of lower quality, and Ripolin cans, on the contrary, were among the first and highest quality enamel paints available in the French market . Historically, the highest quality enamels consisted of only stand oil as vehicle. It is important to note that in the sample set studied, the only non-Ripolin sample analysed, Bengaline bleu outremer (HP019), was the one for which the highest levels of resin diterpenes were detected. Analysis of four paint samples from a Ripolin brochure (B1, c. 1930–1946) [19, 39] revealed a composition of drying oil and Pinaceae resin similar to the corresponding colors from paint cans, although the levels of resin were higher in three cases (Blanc de Neige, Gris Perle Foncé and Bleu Outremer; the Noir d’Ivoire paint swatch showed similar levels of resin to the sample from the can). This finding suggests that the formulation of the paint may have been modified to achieve faster-drying samples for the brochures. Thus, while previous studies have shown the inorganic composition of paint swatches in Ripolin brochures to be highly consistent with the commercial paint in the cans [19, 35], the organic composition of the swatches must be interpreted with caution and may not give an accurate reflection of the actual formulation of the commercial products. As mentioned above, historical literature indicated that copal was a common ingredient in enamel paints. Evidence for the use of copal in Ripolin paints of British production was reported in a study of Dredge et al., as well as in a French promotional video produced by the Ripolin company at an unknown date before 1950 (Fig. 3) Compounds characteristic for copal were not detected in the current study, however. The detection of this semi-fossil resin can be challenging because of the rapid degradation of its characteristic diterpenes upon heating of the oil-resin mixture and subsequent ageing. For this reason the detection of intact copal diterpenes in oil-resin paints by Dredge et al. is unusual. The industrial literature surveyed [24, 25] in fact recommended the heating of copal/oil mixtures in the presence of oxygen (a practice which may be responsible for the fire in the Ripolin factory in 1904) . In earlier studies using Py–GCMS, pyrolysis products of the polymeric phase of copal have been identified as chemical markers for the aged resin, but these too may not be detectable depending on the exact heat/oxidizing treatment and ageing conditions [48–50, 52, 54]. Further research is needed on this aspect of the paint composition, to provide a better understanding of detection limits using current analytical methods for copal that has been subjected to industrial processing, and to investigate whether additional chemical markers, such as reaction products of oil and resin components, may be detectable by (GC)MS methods. 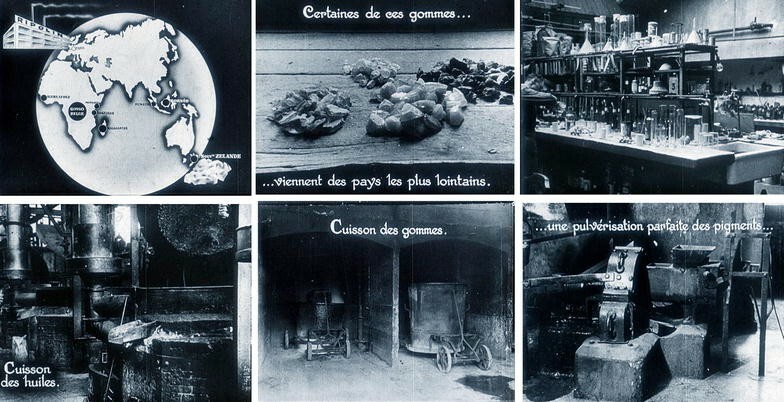 Stills from an undated promotional film produced by Ripolin, showing suppliers of resins and manufacturing processes. Analysis of Lefranc tube paint samples showed the characteristic components for drying oil, as discussed above; a representative example of data for Noir d’ Ivoire is shown in Fig. 2c. P/S ratios were in a broader range than for the samples from cans, from 0.79 to 3.9. Several of these values are higher than it is typical for linseed oil, suggesting that other oils are present in the tube paints; however, because of the wide range of possible oils available to manufacturers at the time it is not possible to make an identification using this parameter alone . As with the Ripolin paints, the lower values may be attributed to the presence of additives such as metal stearates. Trace levels of ricinoleic acid were detected in one Lefranc tube paint, a Laque Carminée Fixe (2007.58), indicating a castor oil component. Several tube paints (blanc de zinc 2009.32, blanc de zinc 2009.49, and bleu mineral 2009.39) showed trace quantities of erucic acid, suggestive of a Brassicaceae oil such as rapeseed. The Su/Az ratios for the tube paints on the whole are lower than those found for the samples from cans: 0.12–0.43. While a few of the higher values might indicate the use of heat-bodied oil, in most cases the results suggest oil with little or no heat-bodying. No evidence was found for the addition of natural resins to the paint formulations, with the exception of two samples (ultramarine no 2 clair 2007.15 and Laque carminée fixe 2007.58) in which traces of Pinaceae resin were detected. Evidence for the presence of beeswax (hydrocarbons and C20-24 fatty acids) was found in an orange paint (2007.04). The new information on the organic fraction of reference Ripolin and tube paints from the first half of the 20th century can be used to deepen our understanding of data obtained from specific case studies of paintings. In this work, we analyzed with Py–THM–GCMS samples from two paintings showing visual characteristics of enamel paints, by Kandinsky and Picasso, artists who are documented to have used these materials. Kandinsky’s Leichtes, 1930 has been listed in the Pompidou catalogs primarily as “oil”, with occasional “oil and enamel” media identifications. Recent research identified a high amount of zinc white with little Prussian blue, trace amounts of barium sulfate and small quantities of lead and possibly cobalt driers in the paint sample of the light blue background paint . Given the similarity of the molecular, elemental and morphological fingerprint of the inorganic fraction in the Kandinsky sample with the formulation of the Bleu Azur Foncé paint of a Ripolin brochure predating 1946, that previous study argued for the use of Ripolin by Kandinsky in select areas of the painting  Py–THM–GCMS of the same sample, carried out for this project, strengthens this hypothesis, with fatty acid ratios of P/S 1.6 and Su/Az 0.39, consistent with heat-bodied linseed oil and similar to the values for paint cans determined in this work (see Fig. 4a). High levels of Pinaceae resin were also identified: these results in combination with the published analytical evidence on the inorganic fraction and the existing visual and documentary evidence support interpretation of the artist’s use of oil-based enamel paint in Leichtes . Py–THM–GCMS data for a a blue paint sample from Leichtes, W. Kandinsky, 1930, Centre Georges Pompidou, AM-1974-16; b a gray/white paint sample from Pêcheur Assis à la Casquette, P. Picasso, 1946, Musée Picasso, Antibes, 1946.1.20. P palmitic, S stearic, Su suberic, Az azelaic acid, 7oxoDHA 7-oxo-dehydroabietic acid, 15OH7oxoDHA 15-hydroxy-7-oxo-DHA, PCP pentachlorophenol (all compounds detected as methyl derivatives). A sample of whitish paint from a drip at the back of Picasso’s Pêcheur assis à la casquette, 1946 was previously analyzed with FTIR spectroscopy and found to contain mostly zinc oxide white, a drying oil and metal soaps. While the FTIR data matched well with reference samples of Ripolin white paint (such as HP002, Ripolin Blanc de neige) further analysis with Py–THM–GCMS conducted for this study demonstrated values of P/S 1.4 and Su/Az 0.19, suggesting linseed oil with no heat-bodying; coupled with only trace levels of Pinaceae (Fig. 4b). Pentachlorophenol was also detected in the sample (as its methyl ether): this compound was widely used in the early 20th century as a preservative for wood and other materials , and it may therefore be associated with the plywood support for this painting, or possibly with the formulation of the paint itself. While the low levels of Pinaceae resin are consistent with results from reference house paints in light colors presented in this work, the apparent absence of heat-bodying is not consistent with data for Ripolin paints and this result remains ambiguous. Because several types of white oil-based enamel paints have been documented for Picasso in the collection of the Antibes Museum, it is possible that the paint in 1946.1.20 may represent another brand with inorganic fraction very similar to white Ripolin paints, but differences in the formulation of the medium . These examples are useful to illustrate the advantages and limitations of the analytical approach. They also underscore how the positive identification of oil-based enamel paints, and especially of specific brands, can be challenging given the compositional similarities of enamel and artists’ oil paints of the time, as well as the possibility of artist’s manipulation of the original formulations. A reliable hypothesis on the specific type of paint used can therefore only be put forth on the basis of the results of multiple types of analysis, taking into account both the organic and inorganic components. As discussed in the introduction, DTMS and ESI–MS provide information on the paint medium composition complementary to that obtained with Py–THM–GCMS. For DTMS, no sample derivatization is required, and differentiation is achieved between organic fractions in the paints: low molecular weight (volatile) species are evaporated and detected early in the analytical temperature program, whereas cross-linked or macromolecular components are pyrolysed and analyzed later in the program. DTMS is a rapid analytical technique, with a typical cycle time of 5 min. ESI–MS is also valuable for the analysis of higher molecular weight species—triglycerides in particular—that are not observed using Py–THM–GCMS, since the latter technique involves hydrolysis of the glycerides to produce methylated derivatives of the component fatty acids. DTMS analysis of samples from cans, paint brochures and tube paints corroborated the Py–THM–GCMS data with respect to the more volatile species: fatty acids were detected in ratios characteristic of drying oils (characteristic ions were m/z 256 for palmitic and 284 for stearic acid, with electron ionization fragment ions of saturated fatty acids at m/z 60, 73, 129, 185, 213 and 241) and oxidized diterpenes (ions at m/z 239, 253, 271, 299, 315 and 330; see  characteristic of a Pinaceae resin such as pine resin in some of the paints from cans and brochures. In addition to fatty acids, glycerides (acylglycerols) were found preserved in about 20 % of the cases analysed (diagnostic peaks including m/z 550, 574–578 and 602–606 indicative of diacylglyceryl ions with C16:0, C18:0, C18:1 and C18:2 fatty acids). Examination of DTMS data for the Ripolin paints from cans provided clues to the chemical form of the resin component in the paint, as illustrated in Fig. 5 for HP008 (blanc d’ ivoire) and HP013 (bleu outremer). The two upper profiles show the total ion current (TIC) for HP008 (a) and the corresponding selected ion current for m/z 253, characteristic for oxidized Pinaceae diterpenes. The 253 ion is most prominent in the later region of the temperature program corresponding to pyrolysed polymeric material, around scans 60–75, suggesting that the resin is present in a bound/cross-linked form as a consequence of the heat processing used in the preparation of the oil-resin medium. These results are compared with the TIC for HP013 (d) and the selected ion current for m/z 253 for the same sample (e). In trace (e) the 253 ion appears in a broader profile, from scans 20–75, indicating that some of the resin in this paint is present mixed but not chemically combined with the medium, and thus evaporates early in the temperature program. This unbound resin component is present in addition to the cross-linked resin that is released later in the run. DTMS data for Ripolin samples Blanc d’Ivoire 53, HP008 (a–c), and Bleu Outremer 13, HP013 (d–f). The total ion current (TIC) and selected ion current for m/z 253 are shown for each sample along with a summed mass spectrum for the region indicated; see text for discussion. ESI–MS analysis of Ripolin paint samples from cans provided additional indications of the chemical reactions undergone during heat-bodying of the paint medium. Figure 6 shows the positive ion mass spectrum of HP087 (gris perle foncé) measured over the range m/z 350–2,000, with an insert showing the distribution of the ammoniated triglycerides (triacylglycerides, TAGs) in the paint medium. The most prominent mass peaks observed correspond to TAGs ranging from m/z 894–898. Table 2 lists the TAG mass peaks with their fatty acyl moiety distribution indicated as Ln (linolenic, 18:3), L (linoleic, 18:2), O (oleic, 18:1), S (stearic, C18:0) and P (palmitic, C16:0); the unsaturated fatty acids may also be present in TAGs as isomers with respect to the position and configuration of the double bonds, which cannot be determined from the ESI–MS data. A further study of the positional distribution of double bonds in the glyceride fatty acids and their extent of isomerization could be valuable to characterize oils according to the heat pretreatments they have been subjected to. Peaks above m/z 900 suggest adducts formed during processing of the oil medium involving heating. Peaks around m/z 1,750 are interpreted as two covalently-linked TAGs. A check over a larger mass range up to m/z 4,000 revealed some small intensity peaks, pointing to larger adducts, but it should be kept in mind that ion formation in ESI is strongly dependent on the polarity of the compounds, which diminishes when TAGs are covalently bound into larger complexes. Some adducts of fatty acid moieties with TAGs have been identified in frying oils  but a characterization of mass peaks observed in the ESI–MS data using tandem mass spectrometry (ESI–MSMS) is not straightforward, and further research is necessary for a more definitive identification of these higher mass species. Research has shown that heating periods of weeks for the preparation of stand oil were not unusual in the late 19th and early 20th century , and in general the process of heating with exclusion of oxygen will lead to complex reactions including free radical formation, cross-linking from radical quenching, Diels–Alder reactions, and isomerization (cis–trans and positional) of double bonds [23, 31]. Isomerization has been found to occur even at relatively low temperatures . ESI–MS positive ion data for Ripolin sample Gris Perle Foncé 10, HP087, with inset showing expanded region corresponding to ammoniated triglycerides as listed in Table 2. In Fig. 7, relative intensities of the TAG mass peaks in ESI spectra for liquid Ripolin medium samples from HP013 (bleu outremer), HP064 (noir d’ivoire) and HP087 (gris perle foncé) are plotted alongside reference data for cold pressed linseed oil and linseed stand oil. The TAGs are plotted in order of increasing saturation (see Table 2). The distribution of the TAGs in stand oil as compared to cold pressed linseed oil can be interpreted in terms of a loss of the more unsaturated TAGs as a result of the prepolymerization treatment. The TAG profiles for the Ripolin media match the profile of stand oil quite closely, and although the greater age of the Ripolin samples must be borne in mind, for these bulk paints aged in a closed container with limited oxygen exposure the initial pretreatment is likely to have had the most significant influence on the TAG composition. This finding thus reinforces the interpretation that in Ripolin formulations the oil has undergone prepolymerization leading to a diminished concentration of the most unsaturated TAGs. Bar graph of the relative intensities of ions corresponding to triglycerides in positive ion ESI–MS spectra of Ripolin samples HP013, HP064 and HP087, compared with reference linseed oil samples; nominal masses correspond to Table 2. Bar graph of the relative intensities of ions corresponding to fatty acids in negative ion ESI–MS Ripolin samples HP013, HP064 and HP087, compared with reference linseed stand oil. The oxidation of unsaturated fatty acids has also been shown to be reduced when ageing occurs in the presence of colophony resin , which could be an additional factor in the greater levels of 18:3 and 18:1 acids observed in the Ripolin samples. In this first study of Ripolin paints with DTMS and ESI–MS, the mass spectrometric approaches clearly show promise for the elucidation of cross-linking and polymerisation mechanisms brought about by industrial processing of oils and resins, as well as by subsequent modification, drying and ageing of the paints, and further research using these techniques may be helpful to develop diagnostic strategies and indicate novel marker compounds for the characterization of oil media. The analysis of the organic fraction of early 20th century oil paints, and the characterization of oil paints in works of art, poses significant challenges due to the variability and complexity of the paint formulations as well as modifications executed by artists. Twentieth century artists experimented with a range of materials including manufactured artists’ paints and also modified/reformulated materials such as mixtures of oils, driers, industrial and house paints. In this study, Py–THM–GCMS demonstrated that the organic fraction of the house paints tested (primarily French oil-based Ripolin enamels) is composed of heat-bodied linseed oil in admixture with Pinaceae resin, with evidence for the addition of castor and rapeseed oil found in a few samples. The identification of other types of drying oils such as soybean, perilla or fish oil recommended for industrial oil-based paints in technical literature is challenging because of similarities in their fatty acid composition. As a comparison, the results from the tube oil paints suggested the use of more than one type of drying or semi-drying oil, as indicated by the more divergent P/S ratios and for the most part they seem to have undergone little or no heat-bodying. Trace levels of Pinaceae resin were found only in a few tube paints, and beeswax was detected in one example. DTMS and ESI–MS data complemented the Py–THM–GCMS analyses, providing indications of the cross-linking and prepolymerization reactions occurring during processing of the oils, and as a result of reaction between the oil and resin components of the paints. Further research on a broader range of reference materials should help in the development of refined strategies for characterizing oil-based paints from the early 20th century. The results of this study indicate that complementary information can be obtained from the study of liquid paint from cans and dried paint-outs, while the media of painted brochures may differ from the original formulation as those were designed for expediency of drying and aesthetics. The results also elucidate how formulations and processing technology influence the physical and drying properties of oil-based enamel paints, in comparison with contemporary artists’ oil tube paints. aAdditions of a few percent of linseed oil to a stand oil medium are still used in the artists’ oil paint industry to obtain a fast-drying surface film with enamel-like properties; Langridge Artist Colors, Factory 23, 155 Hyde Street, Yarraville, Vic. http://www.langridgecolours.com) September 2014, personal communication. MK analysed data and drafted the manuscript; KS interpreted the GCMS data and edited the manuscript; JB conducted DTMS and ESI–MS analysis; MV conducted GCMS analysis; FC supervised the project. All authors read and approved the final manuscript. National Science Foundation, Division of Materials Research, DMR 1241609 the Grainger Foundation, the Stockman Family Foundation, and the Mellon Foundation. Veronique Sorano-Stedman Brigitte Léal, Sylvie Lepigeon, Géraldine Guillaume-Chavannes and Ingrid Novion at the Pompidou are also gratefully acknowledged, as well as Jean-Louis Andral at the Musée Picasso, Antibes, for supporting analysis of the samples form works in their collections; Jerre van der Horst (AMOLF, Amsterdam NL) for assistance with DTMS; Mark Duursma (AMOLF, Amsterdam NL) and Pedro Alves (University of Lisbon, Lisbon, P) for assistance with ESI–MS.